As it has been for those shooting topside with their DSLRs, underwater photographers and videographers have been in the same fix; using the DSLR's LCD screen to gauge focus and composition can be a frustrating experience, especially with the sun behind you. For the DSLR user filming topside, there are several external monitors available that do a better job of enabling you to see and focus on your subject as they can be moved to different positions either on the hot shoe of the camera or even off camera depending upon the length of the HDMI cable you are using. The underwater shooter doesn't have the convenience of being able to place an external monitor 5 feet away or under a sun hood. 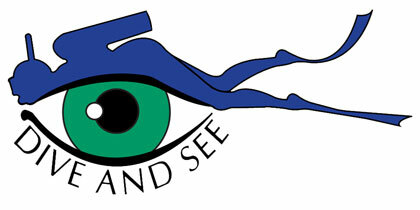 Fortunately, Dive and See, a Torrance, CA. 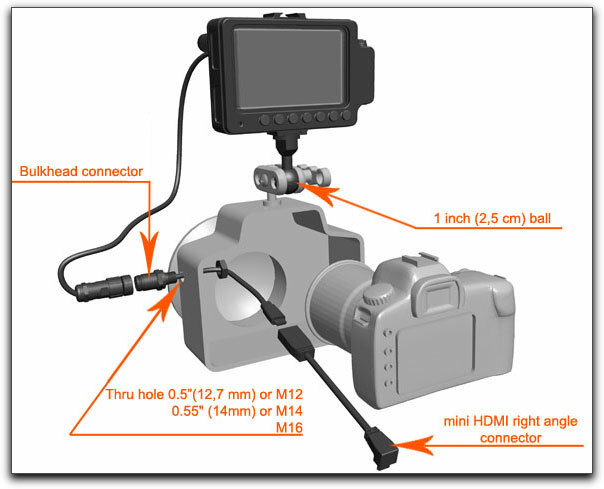 based company, has come up with a feature rich external monitor that can be mounted upon most underwater housings for many of todays more popular DSLRs. Let's take a look at some of its features before moving on to installation and use. The first thing I noticed about the Dive and See monitor were the 5 LEDs on the back of the unit. It is one thing to have to recharge or switch out a battery on dry land, but a whole different ballgame when under water. A small push button next to the LEDs tells you just how much charge there is left on the monitor giving you plenty of notice between dives should a recharge be necessary. For testing purposes, I brought the monitor down to a complete discharge, plugged in the charger, and the monitor was fully charged within the hour. Once fully recharged, the charger cuts off automatically which is common with the higher quality charging systems found today. The charger itself is the typical power cord to AC adaptor to wall outlet that we are used to, but it is also capable of 100V-240V input making plugging it in to the outlet in a number of other countries safe without risk to the monitor or the charger. Another thing that will impress you right off the bat is the solid feel that you get when holding the Dive & See monitor. It has a sturdy and heavy heft to it that is an assurance that this monitor will stand up to constant and heavy use without suffering from the sands of time. The monitor is sealed and cannot be taken apart or opened; the same applies to the HDMI cable that is attached to the back of the monitor, it cannot be removed or disconnected. The monitor also has a valuable cold shoe on its top which can come in very handy if you want to attach a light or even an external microphone if using it for topside filming. The only negative that I can see regarding this is that the heavy duty rubber protector for HDMI connector comes out about 2 inches from the back of the monitor before the cable is on its own to your housing. You can't and shouldn't bend the protector making packing the unit slightly problematic should room in your case be a concern. The monitor is 6" x 4..25" x 2" thick but you need to add that extra 2.5" to its thickness for the cable protector. This is a minor concern for me as I would rather have the extra protection this affords me when traveling with the unit. The Dive and See DNC-5" monitor, charger and supplied cables and connector. Currently, there is no sun hood to place over the LCD screen which, with the sun behind you, would be of great help. There are 7 solid metal buttons along the bottom front of the monitor. From left to right, the power button to turn the monitor on and off. Next is the scaling button which will allow you to adjust the ratio of your video display should your DSLR LCD screen not use the entirety of its screen. With the scaling button you can adjust the display to either full screen, 16x9(my preference)3:2 Full. Since full screen does not display your entire composition as you are seeing it, I would advise one to avoid it. Better to have a smaller but more accurate image when setting composition than not. All good monitors should have a peaking system and Dive and See doesn't let you down on that score. This function, which can be turned on or off when under water, allows you to see just what elements in your composition are in or out of focus. When using the peaking button, the image reverts to a black and white composition and denotes those edges which are most sharply focused with a red color. If left on during record, not to worry, as you will still be filming in the proper color space. 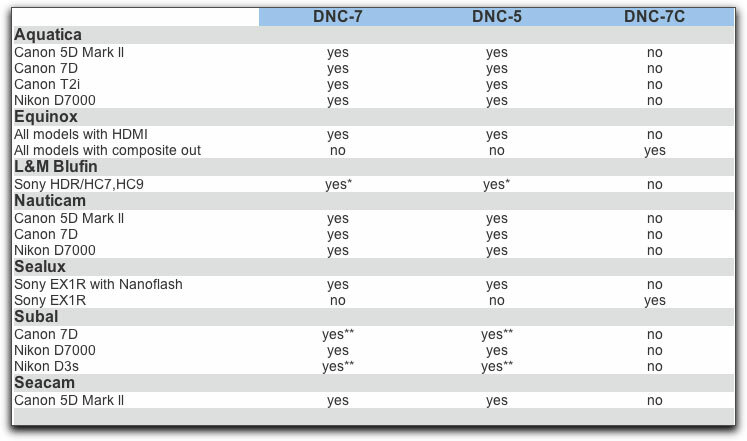 The 3rd from the right button on the Dive and See DNC-5" monitor is also the most feature laden, the Menu button. This button has two buttons activated by the menu, one arrow button on the left and one on the right. Using these enables you to adjust a variety of screen appearances in terms of contrast, brightness, hue, saturation, and sharpness. In truth, once set up and connected to a Canon 7D, I saw no need to change any of the default settings for any of them. Also in the menu choices are 3 user presets that you can use to set adjustments to hue and color saturation if needed. I like this idea as different shooting environments and day and night times can present vastly different appearances. Reverting to a preset provides an immediate viewing change and saves time having to make adjustments when under water. The menu also offers you the ability to have two different guide lines on screen. 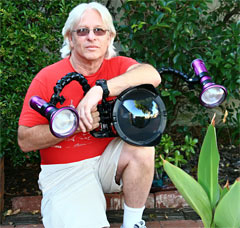 These can be very helpful underwater when trying to set a horizon with surge and current fighting you the entire time. There is also a Blue Gun feature which enable you to use SMPTE color bars to insure the color accuracy of the image you are getting. When in this mode, only the blue component of your image is used and the green and red is turned off. Unless you are experienced with properly calibrating monitors, you might want to use this feature with some caution or avoid it altogether. The last button draws a slightly critical comment from me. It is the Ratio/Exit button which allows you to quickly switch between a 4:3 and Full aspect ratio. For one thing, does anyone really shoot in 4:3 anymore? And since the Dive and See's own Scaling button pretty much allows you to switch between viewing modes, this additional Ratio button seems to me to be completely redundant. I would much rather have had a Pixel to Pixel button in place of it which would be an even greater aid in determining absolute focus. 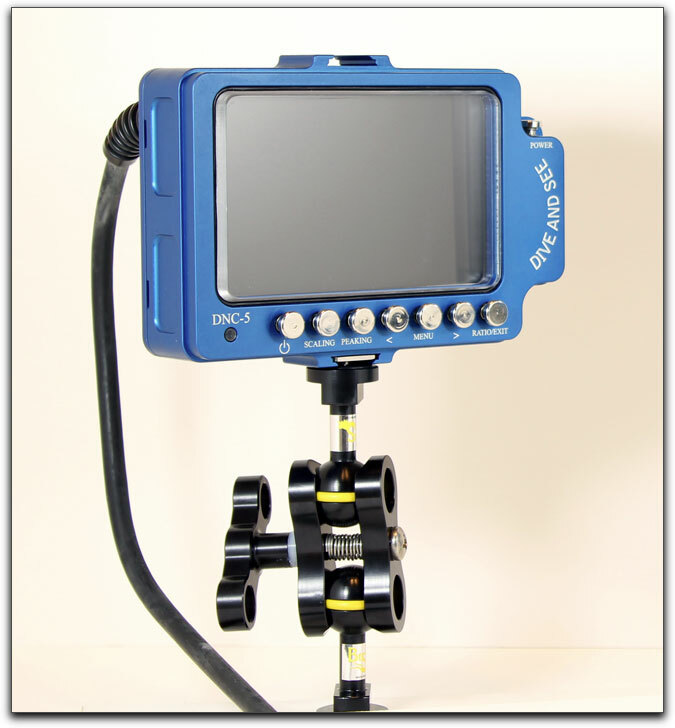 While Dive and See distributes a few different models of monitors, I only worked with the DNC-5" monitor and Nauticam Housing, however, as seen below, the DNC-5" monitor can be fitted to several different DSLRs as well as several underwater housing manufacturers. Installation of the DNC-5" monitor required a cable coming from the monitor to be threaded into the bulkhead of my Nauticam housing. Fortunately, the housing offered a couple of different placements for this and I chose to have it installed in the lower left of the housing. 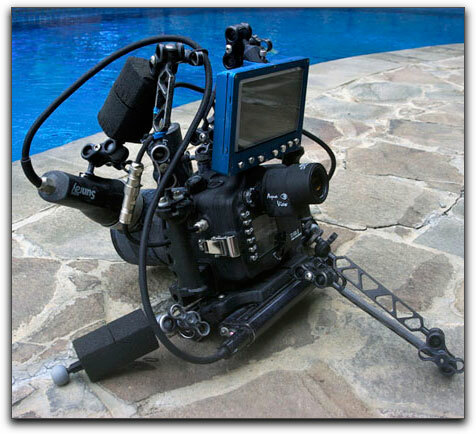 This same flexibility of placement applies to most DSLR or camcorder housings. with the HDMI connector attached through a rear bulkhead port. A ball adapter allows you to place the monitor on top of the housing itself which allows you to move the monitor's position to make viewing easier. No longer does the diver have to get as low as possible just to see the DSLR's LCD screen through the back of the housing. That is the greatest advantage to using this monitor; you can position it almost any way you find comfortable. 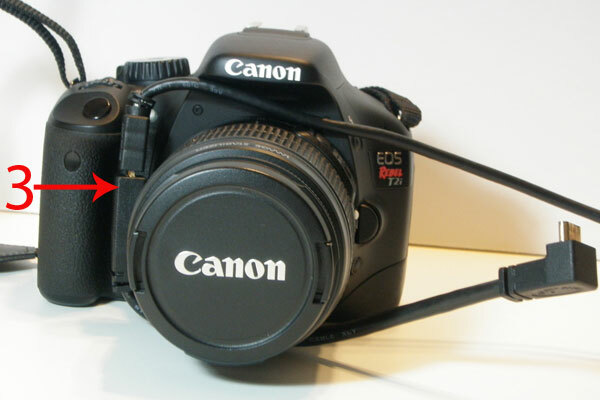 From the external HDMI connector to the interior of the housing, another HDMI cable must be then attached to the camera itself. 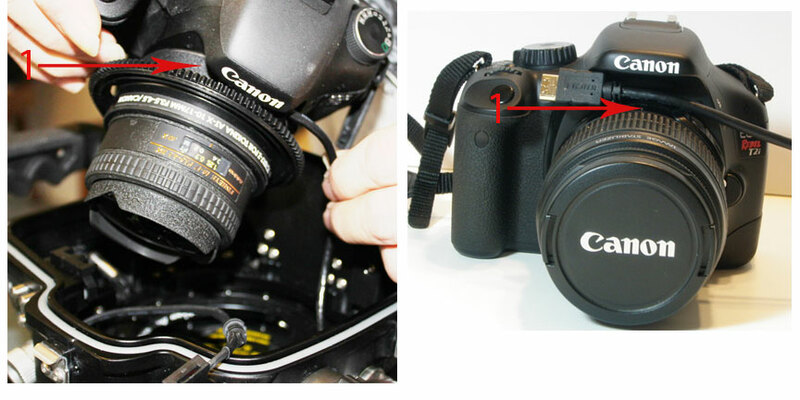 My Canon 7D was using a Tokina 10-17 lens for underwater use. This was the problematic issue. 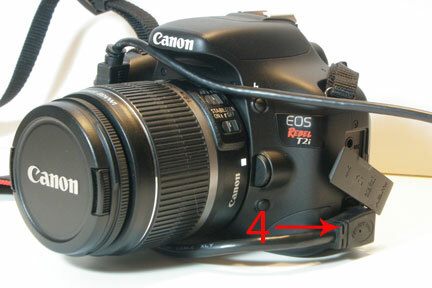 The short cable within the housing that connects from the external cable to the camera's HDMI input had to be threaded between the zoom ring attached to the lens and then wrapped under and around to be then connected into the 7D's HDMI input. There is not much room to do this and I found it a royal pain nervously holding the camera in one hand, barely out of the housing, while trying to thread the cable with the other trying to fit the HDMI cable into the camera. I find it hard to see myself doing this procedure on a rocking boat. HDMI cables are available with swiveling heads and, if I had one, that might have made installation quite a bit easier. However, once this process was completed, I was good to go, though I kept in mind that any time I switched cards or batteries I would have to repeat the setup process again. 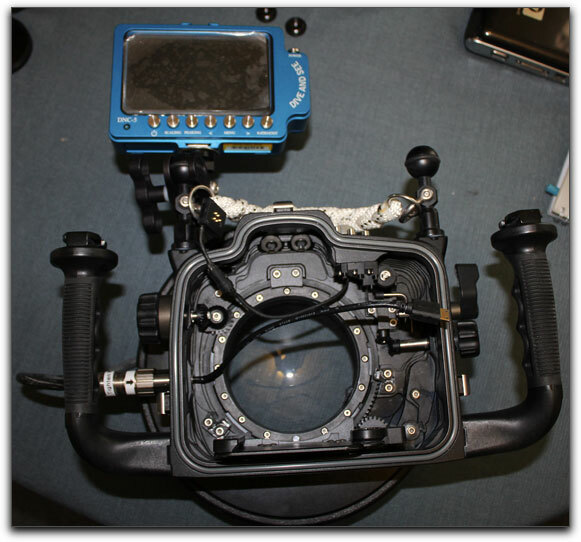 The Dive and See DNC 5" monitor is now mounted upon my Nauticam housing. ready for the camera to have the HDMI cable attached and placed inside the housing. On a dive boat, there is far too much water and spray about to risk getting even a single drop of salt water either in the housing or on the camera, thus making switching out a card or battery on the dive deck or camera table a risky proposition. 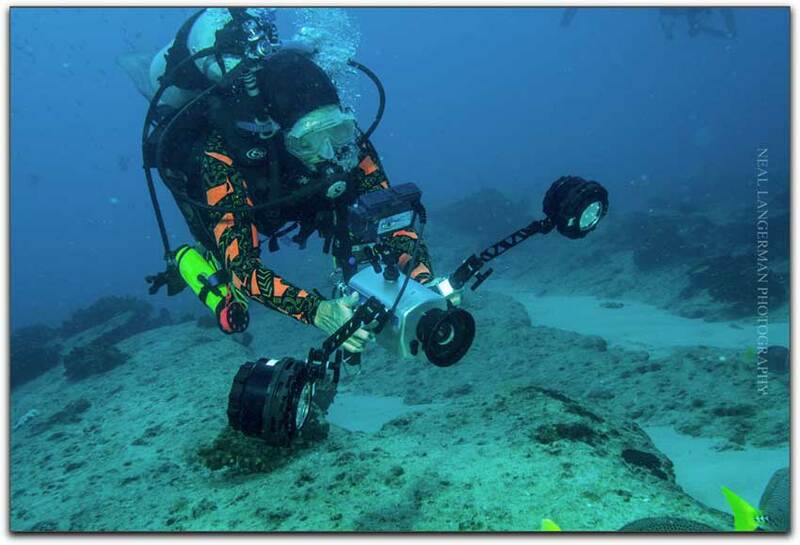 It would be much safer for one to completely dry off after a dive and bring the housing and monitor inside a safe environment before changing out batteries. The only problem with this method is that, on liveaboad boats, the salons are often air conditioned which can cause a condensation problem once you bring the system back out into the open air, so allow plenty of time for the camera system and housing to acclimate, once again, to the outdoor atmosphere. 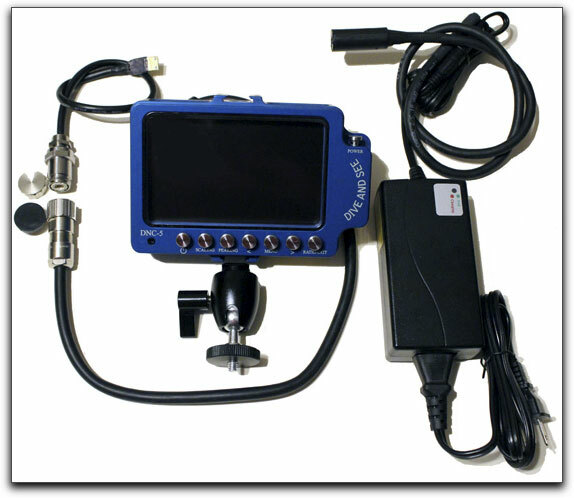 There are a few other underwater monitors, primarily for DSLRs, available. Some that I have seen are powered by AA batteries stored in the housing. To change them, you open the housing for the monitor. The downside to this is that the monitor's housing must have its own 0-rings and latches to close the casement for the monitor creating just one more thing that can go wrong, bringing both heartache and expense. I love that the Dive and See monitor is completely self contained and so easily re-charged making worry over a monitor flood completely unnecessary. With the DNC monitors, concern over opening and sealing the monitor housing or leaking AA batteries is a thing of the past. 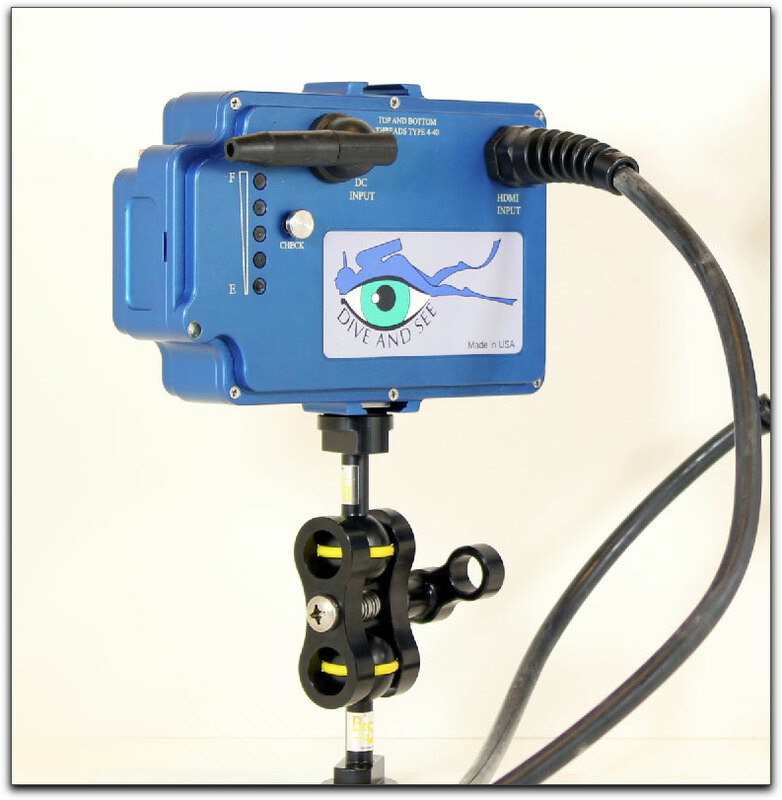 My bottom line is that, while the Dive and See DNC-5" monitor is not inexpensive, for the pro or semi pro videographer or photographer using a DSLR, having such a well crafted external monitor whose LCD screen boasts an 800x480 resolution, and is backed by an abundance of monitor features and choices, becomes almost a necessity for underwater filming. The build quality is as good as it gets, and the image seen through the screen permits a much more comfortable and pragmatic filming experience.